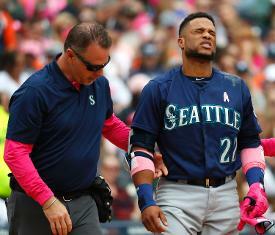 Seattle Mariners second baseman Robinson Cano fractured the fifth metacarpal bone in his right hand when he was hit by a fastball in the third inning against the Detroit Tigers on Sunday. The eight-time All-Star could be facing surgery that would sideline him for an undetermined period of time. Cano was hit on the back of the hand near the pinky finger by an inside fastball from Tigers left-handed starter Blaine Hardy. He was attended to by a trainer and left the game, replaced in the lineup by Andrew Romine. The hand and wrist were in a soft cast after the game. "I knew right away," Cano told MLB.com. "It's kind of the same feeling when I broke my pinkie toe in Japan (during an offseason tour in 2015). I knew right away." Cano was scheduled to fly to Minneapolis with the team Sunday night and then continue on to Philadelphia to be examined by a specialist Tuesday. Cano has appeared in 2,035 games, including at least 150 in each of the last 11 seasons, since his Major League debut in May 2005. He went on the 10-day disabled list in May 2017 due to a strained right quad muscle. Cano is batting .287 with four home runs and 23 RBI this season. He hit a three-run home run Saturday in the second game of the doubleheader against the Tigers.